Most Atlantans would think twice before handing a hammer to a kid in a park with the suggestion, “go play!” Yet this is exactly what some parks are doing in Great Britain and increasingly here in the US. The belief that risk, authenticity and play go hand in hand is something most older grandparents might muse to the younger generation, entreating them with “in my day, and with nothing more than a stick and tire, we had FUN, none of those playstation shenanigans!” I believe the rise of the Maker Movement and STEM education have spurred similar conversations about classroom instruction. Teachers, policy makers, education reformers and philanthropists are increasingly discussing ways to embed play and authentic learning experiences into the classroom as an effective, if not essential, practice to ensure kids are ready to thrive in the real world. Closer to home, we are starting to take early steps in this direction, as evidenced by the recent passage of the recess law passed in Georgia, which I view as a small step toward a holistic approach to learning needed to ensure kids are ready to thrive in the real world. I began typing this blog while waiting with my family for our plane to London to take off. My kids, needless to say, were more excited about seeing Platform 9 3/4 than Windsor Castle, but now in our second day of vacation and after spending a couple hours in Hyde Park, they’re as excited about a playground as seeing Harry Potter. Under a bright, sunny sky we visited the Princess Diana Memorial Playground. Considered by many as one of the best kids’ parks in the world, we were excited to visit and immediately saw what all the fuss was about; kids were having a blast swinging on the lines of a wooden pirate ship, knocking each other over on a suspended rope bridge, and, my favorite, finding a hidden section of the fence that lifted up with just enough room for a small kid to enter a secret garden. I wished I could squeeze in, but knew that not allowing adults was probably intentional. If I could imagine the best part, it was getting out of the secret garden. Kids had to climb up a real tree, walk down a long limb that was perched over the fence, and then jump down five feet before running off to more adventure. I could easily identify the American tourist parents, wide eyed with hands reaching up to catch their kids before even hearing them shout, “don’t fall!” or “go back!” And to be perfectly honest, that was my first inclination as I imagined my kid falling and getting hurt. It made me realize how hard it is to practice what I preach. 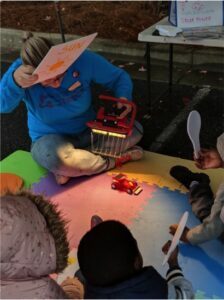 As the founder and executive director of Community Guilds and our STE(A)M Truck program, I created a mechanism that allows local experts to teach inside schools (or outside in their parking lots) using real tools and technologies. 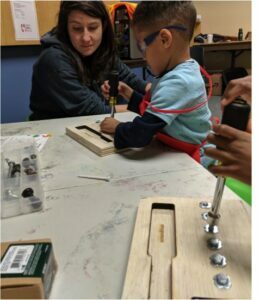 On social media you can see even the youngest kids we serve using real hammers, and by 3rd grade kids can build with bandsaws, laser cutters or 3D printers. We intentionally introduce kids to tools that are not often used inside public schools because, we believe, agency and autonomy are naturally embedded when kids use real tools. And much like what happens in the playground mentioned above, we allow kids an opportunity to learn outside the proverbial “box.” However, since our work happens inside and during the school day, this approach is about transforming the classroom experience by shifting the mindsets and expanding the skill sets of teachers to change what is possible from within the four walls of a classroom. Most readers should question if external programs can make systemic changes in public schools. The short answer is, “no,” probably not, at least not in isolation. Anyone who has spent a career in educational reform, or has even just stepped inside an under-performing school, rightly believes there’s no silver bullet. But I sense a growing movement and shift in beliefs. 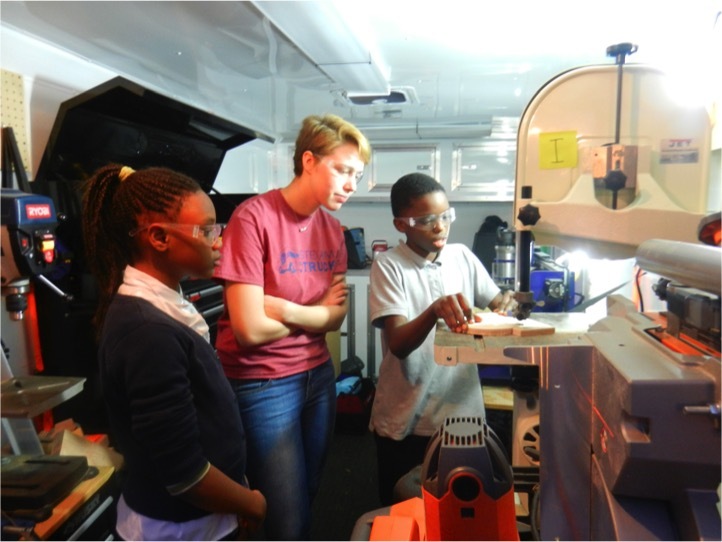 If we can harness true problem-based learning as a natural component of STEM education, and ensure the creativity and innovation that the Arts provide, while instilling competency-based evaluations advocated by maker movement practitioners, we can embed agency and authenticity into the classroom. Of course, everything I mentioned above is not new. Just ask your grandparents how they learned the real skills they used throughout their lives or how parents in Great Britain advocate having their kids take a leap off a high branch. I can easily imagine public schools taking the best parts of the past to shape an educational experience that prepares youth for the future. In the meantime, I’m looking forward to playing in more parks with my kids. Pass me a hammer! Jason Martin is the Executive Director of Community Guilds and its STE(A)M Truck program. STE(A)M Truck was recently selected by Learn4Life as a ‘Bright Spot’ in 8th grade mathematics for its strong results in supporting school culture and teacher effectiveness, and providing interventions for struggling learners. If you’d like to help scale this incredible work, you can join the 8th grade math network here.